My hopes for this How To page is to give you little bits of information that could help you learn a few new things when it comes to Breakfast! 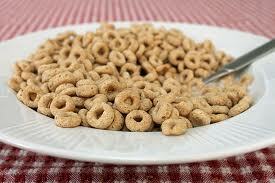 If you prefer to eat a simple and quick healthy breakfast, such as cereal, great! Eating cereal is also a super easy way for those who normally don’t breakfast. My three favorite cereals right now are Cheerios, Smart Start, and Raisin Bran (Post doesn’t contain high fructose corn syrup like Kellogg’s does). Compare that to the cereals I loved to eat growing up-Trix, Lucky Charms, and Cocoa Puffs…. • Sugar. I’ll be touching on this topic a lot. Sugar is not our friend! When sugar is one of the first 5 ingredients (in anything!) expect that this particular food item is probably going to be low in its nutritional qualities, so try to aim for a cereal that is not full of sugar. • Fiber. Try to choose a cereal that has at least 5 grams of fiber per serving. Men needs between 30 & 38 grams of fiber a day while women need between 25 & 30. Choosing a cereal that has at least 5 grams of fiber per serving will definitely get your day started off right! • Calories. Check the calories per serving, taking into account what kind of milk you use. I use non-fat, which saves in fat and calories, so if you’re currently drinking whole fat milk you might bump it done to a low-fat to see if you like it as this will save you calories in the end. Remember to add your favorite fruit to your cereal! I love throwing blackberries on my Smart Start cereal-Delicious! Cooking eggs is a fairly simple process for most, but you just might be surprised to know that a lot of people don't know how to properly cook an egg, so let’s have a look at how to cook eggs some of the more popular ways – fried, scrambled and boiled. Fried eggs are just as easy, but if you don’t want your cholesterol count to go off the wall, cook your fried eggs in a non-stick frying pan and use cooking spray, or use a little butter. Heat the pan gently on a low flame and then crack your egg open, trying to make sure that you don’t “break" the yolk. You can use a spatula to shape the egg white as it cooks, and to turn your egg over and finish cooking the white over the yolk. You should be careful doing this and keep the spatula close to the pan to avoid breaking the yolk. Cook the egg for about a minute once it’s been turned. Finally, let’s try some scrambled eggs. Crack a couple of eggs into a bowl, add a little milk, salt and pepper and whisk the eggs with a fork until the white, the yolk and the milk are all mixed together well. Heat your frying pan, once again with very butter and then pour the mixture into the pan and let it cook for a minute or two. Then with your fork or a spatula, stir the eggs to keep them from sticking to the bottom of the pan. Cook them until the white is no longer runny. A number of people wanting a nice soft-boiled egg either end up with it being hard-boiled/overcooked or under-cooked with the white still runny. The best way to cook a soft-boiled egg, which is perfect for dunking your toast in, is to heat the water in the saucepan first. When it is boiling, introduce your egg on a spoon to avoid burning your fingers. Turn the heart down a little and leave your egg for three to four minutes. If you don’t want to stand around looking at your watch, an egg-timer may work for you as it will notify you when the time is up. If you want hard-boiled eggs for a sandwich or salad, simply extend the cooking time to nine minutes. *So now you know how to cook eggs! Eggs provide lots of protein and are part of an overall healthy diet. How to Get Your Kids to Try New Foods! Getting kids to try new foods can be quite tricky! Once they are used to eating certain types of foods, they usually don't want to explore any new foods as they figure they already know what they like to eat. It can be especially difficult when a food looks odd to them , which can be anything that they're not used to seeing and/or eating. Make a chart with a list of new foods you think your kids may like to try (with them if at all possible! the more kids feel like they have control over what they can eat, the more willing they will be to try it!) Every time they try the new food, put a start by the ones that are a hit, and an x by the ones they didn't like along with the reason for not liking it. Over time, have them periodically try the foods they didn't like again, making additional notes if necessary. This should continue until any new foods that are not liked are tried a minimum of 12 times (I know... this sounds like a lot! but this helps them to become familiar with a food and by trying it periodically over time they are more likely to become familiar with the food and accordingly are more likely to accept it). Make sure you are fully aware of any allergies to foods that may run in your family so you are able to make the best new food selections. Also, kids under the age of one really should not have eggs or honey and kids under the age of 2 should not have peanut butter or nuts. Tired of spending a small fortune when it comes to buying mayonnaise? Of course, you can wait until your particular brand goes on sale and then also use a coupon, which will save you money. Although, know that store bought mayonnaise contains ingredients that can be avoided by making your very own mayo at home with all-natural ingredients. Additionally, you can adjust the recipe so that it perfectly suits your particular taste! There's only a few ingredients that make up homemade mayonnaise, and since they are all natural ingredients that are easy to find in your cupboard, you're avoiding all the additional preservatives included, which are not healthy and should be avoided if possible. •	Any type of spice you like! (you can experiment by dividing up the mayo and adding flavors you think might be appealing when it comes to using mayo for sandwiches, etc. 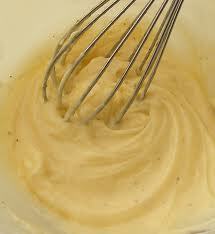 Combine the egg and lemon juice in a bowl, and whisk. As you whisk, slowly pour in the oil. Add water to get the consistency you want, and then the rest of the ingredients. If the mayo is to think, add more water, and if it doesn't thicken, then you may need to either start over or add another egg and build on what you have. This recipe makes about 1/2 cup of homemade mayonnaise and should be used within 5 days. Be sure to pour the oil in slowly! Be sure to keep your homemade mayonnaise refrigerated! A Variety of Delicious Potatoes! Eating breakfast is essential to your feeling energized for the day! There are lots of healthy breakfast choices from which to choose, so today we'll find out how to cook potatoes for breakfast (aka hashbrowns) so that they are full of flavor yet still healthy to eat. Cut up the potatoes (the smaller the cut, the faster they'll cook), the onion, and the peppers. Put enough oil or butter in the pan to cover the bottom completely (as you don't want the food to stick) and turn it on medium to medium-high heat. Put the potatoes in first, stirring every few minutes or so that they cook evenly and when they start to get that nice brown color on a couple of sides that means it's time to put in the onions. Continue cooking for another 5 minutes or so and then add in the peppers. Another 5 minutes or so and wala! Sprinkle the salt on top to bring out the flavors and you're ready to eat. You're kitchen is going to smell absolutely delicious and you've got a great side to go with either fried or scrambled eggs! Add a couple pieces of sliced whole wheat toast on the side and you've just made a really scrumptious breakfast that you'll probably want to make at least twice a month. *You can choose to first boil the potatoes for about 10 minutes in order to reduce the time needed for the potatoes to cook when you throw them in the pan. *Soak the potatoes for an hour or so in order to reduce the starch.